Would these crochet mermaid blankets — or mermaid Afghans, as they’re also called — be a “splash” in your home? This popular idea has been circulating around the internet, and we’ve found some free patterns for you so you can make as a crochet project yourself if you want. The one we found was created by Nadia over at Yarnutopia. She doesn’t even mind if you use her patterns to make money off of Etsy or other sites, she wrote, but just make sure you make a note that she’s credited for the patters. 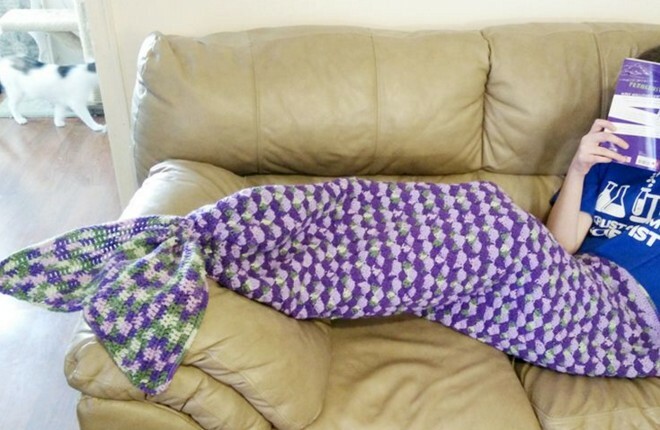 The patterns are three sizes of crochet mermaid blankets. The smallest crochet pattern will make a mermaid tail to fit a child who is 4 foot 5 inches tall. The medium pattern will fit those 5 feet to 6 feet tall. Then there is a large pattern for anyone over 6 feet tall. Giant mermaid tail Afghans. Then there is a tail fin pattern that is just one pattern — you can affix the tail fin to any of the afghan mermaid tails. For all the patterns, the width is the same. That means thinner and thicker people can use them — they’re around 50 inches wide. Nadia opted for a scaly pattern in blue for her tail, unlike the ones pictured above. We feature that above image because people like the idea of those pastel-ly aqua color and wine color. The colors provide an interesting eye texture. There’s another crochet mermaid tail pattern available for free, too. The one in the image above. It’s an adult sized one and it’s the work of Shelley Bunyard over at MadHooker crochet page (link to this free pattern also provided below). The materials you’lll need: Medium (worsted) weight yarn, 2 or 3 skeins Macaw, jade, peacock (these are the colors she used), J-6.00mm crochet hook, Yarn needle Stitches used: chain, slip stitch, double crochet, and single crochet. Here is the 3 sizes patterns. It’s a PDF, and remember, it’s the work based on several online patterns of Nadia at Yarnutopia. Click here to open. For the adult-sized crochet pattern pictured at the top, click here.